VoteWatch Europe A.I.S.B.L. is a not-for-profit organisation registered in Brussels, Belgium, that works for better debates and greater transparency in EU politics. 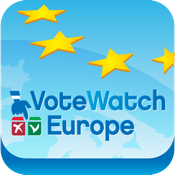 The VoteWatch Europe app gives you quick access to voting and activity records of Members of the European Parliament (MEPs), as well as voting trends during the current parliamentary term (2009-2014). - Voting trends, such as: which MEP or political group is most influential?